When designing a golf fitness program, the strength training professional needs to create a routine specific to the participant in order to achieve maximum results. On this page, I will outline that main issues and differences regarding strength training for seniors (and older golfers) that need to be examined and addressed by the workout routine. Golf is one of the rare sports that can be played for practically your entire life. Undoubtedly, this is one of the reasons why this sport is so popular! However, participation in sports and athletic events later in life leads to an entirely different set of challenges that younger golfer may not have to face. Not only are older golfers playing against the course, but they are playing against their bodies as well. Those are just a few examples, but you get the idea. There is hope, though! Research has proven that older adults can benefit from resistance training and exercise and can slow down some of these natural processes. Strength training for seniors is extremely important and can lead to a much higher quality of life (and hopefully, better performance on the course). Expanding off of the information listed above, there are many age-related changes that occur to our bodies over time. The two main components that we lose as we age are bone density and muscle mass. Bones becoming more brittle with age is a very natural process, but can lead to a wide variety of issues, particularly injury. The two common terms associated with this loss of bone density is osteopenia and osteoporosis. In basic terms, osteopenia is the precursor to osteoporosis. Both of these conditions increase the risk of fractures. These fractures can be devastating, and can lead to widespread functional limitations with day to day activities. Looking specifically at your spine, a change in your resting posture as a result of bone density loss could inhibit large components of the golf swing. A rounded posture, or kyphosis, could lead to increased shoulder stress and injury. Also, range of motion will be greatly affected at the shoulder, which would rob the golfer of power and distance. Combine that with a lack of motion and flexibility at the spine, and your golf game will be radically different! Moving on to your muscles and soft tissue, there is a general muscle loss that occurs gradually after the age of 30. There also is a shift in muscle fiber types to more slow twitch fibers, which in turn, will cause less force production. 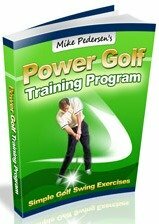 Maintaining this power through a golf strength training program will not only help your game, but will lead to greater ease with normal, daily tasks as well. The most important thing to remember for those looking to begin a training program is that your age does not affect your body's response to exercise. This is extremely important to realize because we can control some of the natural effects of aging through exercise. Prior to beginning any golf fitness program, a full medical screen should be performed by your physician in order to clear you for exercise. Also, if you are working with a trainer, making sure that they are fully aware of any pre-existing medical conditions is extremely important. The program itself should start at lower intensities compared to that of a younger participant in order to monitor effects and acclimate the golfer to resistance training. Also, training frequency should be reduced, at least initially, to 2-3 days per week. All exercises should also be performed within a pain free range of motion. This is crucial as older adults may not have full motion available to them at specific joints, and "forcing it" should not be an option. In addition to weight training, flexibility exercises are also a must for any program. Often, older adults are "tighter" than their younger counterparts. This could present in numerous ways, such as postural imbalances, balance issues, and lack of range of motion. While some of these issues may not be able to be completely fixed, addressing them with appropriate stretches will certainly help. Finally, properly warming up for about 10-15 minutes prior to beginning a resistance training routine with light aerobic activity will help prepare your body for exercise by getting more blood to your tissues. Strength training for seniors and older adults provides all of the normal benefits of exercise and can help slow down some of the natural processes of aging. If you are a golfer and are looking maintain or reach a high level of play then a carefully constructed resistance training program is a necessity.